What if I told you that the same architectural designs one may find in the iconic Chrysler or Empire State buildings can be found in the designs of most residential buildings in the Bronx? The skyscrapers of the Boogie Down might not be as high up as that of Manhattan, but the two boroughs share more than slabs of concrete and connecting subway lines. Tasked with exploring the history of Art Deco in the Bronx, honestly, I didn’t have the slightest idea where to begin. I know nothing about architecture. I mean, I think buildings are pretty, and I like taking photos of them, but to explore the angles and curves of why the architect chose one design over another and their motivations, I’m completely at a lost! I figured I’d start the way I’ve always did with a paper: go to the library (you thought I was going to say wikipedia or Google...shout out to the old school crew who know what the Dewey Decimal system is). There are many buildings on the Manhattan island which exemplify this description to the tee: as mentioned above, the Empire State and Chrysler buildings, Radio City Music Hall, and Rockefeller Center. But in the Bronx? Well, it’s actually a lot more visible to us then we realize. Enter in Mark. I met him a few Saturdays ago while on a visit to the Bronx County Historical Museum. I figured if there were any place that would have anything archival about Art Deco in the Bronx, it had to be here! Our meeting was all the more serendipitous: I had failed to realize that one needed to make an appointment at the museum to review their archives, but Mark, a Bronx native, happened to be at the museum that day, and took the time to speak with me about art deco and toured with me along the Grand Concourse to where a majority of this style can be seen. In thinking about my own apartment, which I love dearly, and receives a wealth of light all around and throughout, I recall my initial process when looking for an apartment; and how adamant all my friends were about having a “prewar building” (when really I just needed A BUILDING!). I paused Mark in our discussion to inquire about the difference between the terms “prewar” and “art deco”: “One is a realtor’s term, the other is an architectural term”, Mark defined. So be careful out there, my fellow apartment seekers! We walked into the entrance of 200 E 204 street. The floor was covered with multicolored tile, the faces of the steps that of cracked marble. Mark points to the walls. “Check out this design. This design, and the coloring, is typical in front areas of some art deco buildings.” We stood in the front entrance, admiring the lobby from behind another set of doors we couldn’t get through. Mark immediately points out the heat grate, the design resembling that of sun rays. As Mark began to talk about the design of the elevator door, a mailman and a resident of the building came in behind us. “Oh! Great, we can get a better look!” The building was warm, and a door somewhere on the first floor was open blasting loud party music which felt rather contrast to the mission at hand. Looking at the elevator door, I’m reminded of Batman. Actually, all things art deco remind me of Batman and the Gotham aesthetic. We round a corner and Mark points out a defunct trash shoot, its door painted bright orange. Another heat grate with the sun rays design comes into view, this time the rays looked to be sprayed painted off-white to match the adjacent wall. Getting our fill of art deco from our first location (and I growing nervous that someone might think us as loiterings), we leave the building and try our luck with the one across the street at 190th. Immediately, the building is at sharp contrast to the one we just left. And I mean SHARP! Shiny silver metal doors greet you as you walk up along the rounded grey carpet underneath the exterior outcrop. These first set of doors led to another set of shiny silver doors. We were barred from entering, but didn’t stop ourselves from pressing our faces against the glass to see the lobby. Eggshell white walls with vertical stripes of red and soft yellow; the infamous art deco floor design ran all the way out of view from where we stood, designed with various geometric shapes in black, yellow, white and grey. A mirror hung above what resembled a curved fireplace, simply reflected the egg shell white opposite it. Another heating grate, which appeared more modern than the two others at the adjacent building was painted that same soft yellow, the outline of the sun and its rays more apparent. Standing there, there was something poetic about the design, and not being able to touch it frustrated me a little. We waited a little longer to see if anyone would let us in, my money on the mailman. No one came, and so we left. Eventually, I parted ways with Mark, so happy to have spent the afternoon exploring together. He waited for me at the bus stop and urged me to sit somewhere on the bus where I could take in all the art deco that lines along the Grand Concourse. The entire ride I looked at the Grand Concourse with almost new eyes: outcropping brickwork with alternating colors, curved edges, straight edges, mosaic designs, large windows that took in lots of light. Many public institutions reflected the design of art deco as well. The more obvious sites like the Bronx County Building still hold fast to this design, including the Emigrant Savings Bank. As I continued my route back home, I wondered if the people who walked this boulevard day in and day out appreciated the beauty of this part of the Bronx. It definitely has helped me to love it even more. The Bronx is home to artists, musicians, writers, entrepreneurs and regular folks, who make our borough vibrant, diverse, and dynamic. At Bronx Narratives, we look forward to learning about and sharing the innumerable stories that exist in our hometown. Reading that Mary Higgins Clark, Al Pacino, and Carl Reiner, are all native Bronxites shocked me. To think that some of my favorite artists and writers are from my hometown inspired me to continue honing my writing skills, because maybe, just maybe, I can become a successful Bronxite like them. But, I shouldn’t have been too surprised by the various talents that came up in our borough, after all our grit and resilience are bar none. As we head into 2019, we invite you to meet some of the Bronx Narratives team members who are striving to make the Bronx a little better than the way they’ve found it. HN: What led you to create Bronx Narratives? DG: Me and the co-captains felt the need to change the narrative of the borough and let Bronxites create their own instead of being stereotyped by often outdated and misinformed media. The Bronx isn't perfect, we have a ways to go but I'm happy to be a part of the mission. HN: What would you most like to see brought to the Bronx (affordable housing, jobs, etc.)? DL: More creative spaces for an intergenerational audience and more restaurants/lounges for everyone! We shouldn’t have to leave the Bronx to chill or eat. HN: What are you most passionate about? SH: At the moment, mentoring and helping people grow their passions. HN: What do you love most about the Bronx? HS: I appreciate an environment that brings me peace - there's plenty of greenery amid the concrete. Walks in the park, meditating to the sounds of a running river, watching the sun set, birds chirping. That's what I love about the borough. HN: What’s your favorite restaurant in the Bronx? PP: Liberato Restaurant in Burnside Ave off the 4 train. KS: Anything that will help the Bronx and her residents thrive. I do believe we need more job opportunities in the Bronx but I'd also like us to create them by owning businesses. For my first assignment as a new staff writer for Bronx Narratives, I conducted a brief interview with Dondre Green, the founder of the online and physical Bronx based publication Bronx Narratives. Dondre, who is a native of the Bronx, as well as the magazines lead photographer and creative director, granted me access into a deeper look inside the publication. RICHARD DEFINO: Hi Dondre. Before we get started, I wanted to take the time to thank you for allowing me the opportunity to write for Bronx Narratives; it’s a real honor to work with you and share my story with Bronx readers, writers and artists alike, both from the Bronx and outside our home borough. For my first story with Bronx Narratives, I’ve been selected to interview you--my goal is to familiarize the readers with yourself and Bronx Narratives. I’m really excited about this interview and thought we could first start with an introduction of yourself before we got into the thick of it. Thank you! RICHARD: Can you tell me a little about yourself? DONDRE: I’m a Bronx-born and raised curious human who enjoys simple things and creating solutions. Some of my passions include: Photography, Design (Graphic, Interior & Stage), Basketball and Community. RICHARD: What inspired you to start Bronx Narratives? DONDRE: I felt there was a niche in our local media sources to create something that felt more authentic, more innovative while being fully community centered. In 2014, after me, Decota (our now Logistics coordinator) and Hoay (our now Art Director) threw our first Bronx event ever at The Point, I wondered what building a long term community infrastructure would look like and how we could attract and share more interesting Bronxites in a variety of ways. We met up with people who attended the event a few weeks later at The Bronx Library and started listening to ideas of what Bronx Narratives could look like from the eyes of people who live here. It was refreshing. In addition, my friend Jack Sommer, also played a huge role in the publication, I’d actually say he low-key mentored me during the early stages, he’s always been someone to help people near to him organize their ideas and offer honest feedback with anything you present his way and for him I’m thankful. RICHARD: What can people expect from Bronx Narratives in 2019? DONDRE: I think each year we’re trying to grow and challenge ourselves by taking leaps that allow us to continue our mission and I believe in 2019 ongoing local partnerships will allow us to event plan and be a bit more strategic with our goals when it comes to serving the community. RICHARD: What changes will there be from previous years? DONDRE: I don’t think they’ll be changes per se but as each year passes by, the captains and I all approach each year with a new level of focus and setting the tone with the energy we expect from our teammates. RICHARD: What do you love/dislike the most about the Bronx? DONDRE: The people. I love Bronx people, they’re resilient. If you know where to go, you know what the Bronx has to offer when it comes to food. Things I dislike are public transportation within borough and lack of resources for low-income individuals. RICHARD: What was your favorite street pastime as a kid? For example; manhaunt, stickball, hanging with friends, etc..
DONDRE: I would play basketball pretty much all day with my brother during the summers, just to stay active. Most times with my neighbors too to spice up the competition. Reflecting on it, those were really fun times. RICHARD: From your perspective as a Bronxite, innovator, or just as Dondre Green, what are you most proud of? DONDRE: I think putting Bronx Narratives in a space to serve the community in ways I’ve never imagined is a start. For instance at our Bronx Day Party at the Bronx Museum this past year, afterwards I felt charged up seeing everyone come together and share that special unity we hold in our hearts. My team has been planting seeds for quite some time now. RICHARD: Dondre this was great, thank you for your time and for allowing me to interview you! I can’t wait to see what the future holds for Bronx Narratives. DONDRE: Thank you and glad to have you on board. Filmmaker, Adiana Rivera, can be found around the borough capturing the pulse of events and collaborating with other Bronx creatives. Adiana is a vibrant personality with a knack for storytelling through her video work. She’s recently embarked on a new visual project, called “Bronx Boys” which highlights men from the Bronx. I initially saw her numerous posts about the project on Instagram, so I reached out to her to learn more about the inner-workings and what prompted her to start it. 1) What inspired Bronx Boys? Why was it important for you to create it? In general, the Bronx inspired me. I grew up here my entire life and I’ve always loved what the Bronx gave to me. I wanted to give something back, but didn’t know how. Documentaries and photos are insanely powerful, and that’s the only tool I knew to use, so I wanted to create a documentary about the Bronx. I always loved profile pieces whether in articles or in documentaries, because I felt they talk about broader issues using the subject’s day to day life. And then one day my thought process fell on my brother. I thought about his pre-teen to teen years growing up in The Bronx. I remember being in elementary school and walking to the corner with him so he could fight another kid because he spoke badly about our mother. I remember him coming home bloody from a fight. He was just surrounded by a lot of violence once he left home and entered the streets. It always felt as if he was protecting his manhood. He had a different outlook on life. A lot of other Bronx Boys I would meet were these amazing, talented individuals, with these similar stories to my brother. They were poets, painters, athletes, rappers or honestly just the sweetest individuals, but each of them shared a violent past in someway or another. It just felt so important to create this project to highlight them, because I needed people to see these boys for who they were. Not just a statistic, not just their borough, not just another story. I needed people to know that gems were created from The Bronx despite any hardships. I needed others to know that this borough provides inspiration and is the home to some of the strongest, most creative, passionate people I know. I needed people to know that the violence is just a factor from our circumstances. 2) Have you read the book “Bronx Boys” by Stephen Shames? I haven’t read Bronx Boys, but once I’m finally done with this project I’m going to reward myself with buying Stephen Shames book. I wonder if there are going to be any overlapping messages and ideas between his book and my mini-documentary series. 3) How did you come up with the name “Bronx Boys? It’s kind of silly how I came up with the name. I was just sitting thinking of titles that would fit with the Bronx just cause. First I landed on Bronx Bars, and thought I could do a Bronx Bar crawl, which I did attempt too but I never edited any of the footage and only filmed on my iPhone. Then Bronx Boys popped up in my head and I knew that would be the perfect title for my project. 4) How long did it take you to complete this project? The project still isn’t complete yet. It’s a ton of work. The first four episodes took almost 3 months because there was so much trial and error. I’m still working on the last four episodes and my hope is that I can finish it in about 2 months. Actually, I shouldn’t say hope, because it has to be completed within that time frame, as the first four episodes are dropping before the last four are completed. So overall, it’s probably a 5 month long process. 5) How’d you go about choosing the boys in each episode? Why specifically did you choose to highlight boys? I chose four boys who inspired me. In reality, they’re grown men, but the term “Boy” refers to their childhood and the idea that as the Bronx grows, so do they. With the four that I’ve chosen, we’ve run in similar circles either from my childhood or my semi-recent involvement with The Bronx. Their passion and past had me in awe. I decided to highlight boys, because of my brother and all of the male individuals I’ve met who grew up in The Bronx. I felt as if these men encompass the Bronx overall. They’ve encountered Bronx violence. They’ve had to survive with less than ideal not ideal circumstances, but it didn’t matter. Their passion and their love for the Bronx didn’t falter. 6) Did you film and edit everything yourself? If so, what was that process like? I did film and edit everything myself! The process was a mix of simple and insanely hard. On paper it’s setting up a time to meet with one of the men, interview them, capture b-roll, edit once footage is captured. But of course setting up times were difficult, because everyone is living their own life with their own busy schedule. Filming gets harder the colder it gets, and the more it rains. Then once I was done and it was time to edit, which was hard because the only feedback I had was mine. The only person I could really bounce ideas off of was myself. Eventually I did turn to other creatives for advice and opinions, but there was a lot of internal dialogue for this project. 7) What do you hope people gain from viewing this project? I want them to gain insight and have conversations. By the end of all the episodes, I want them to wonder about The Bronx and everyone who lives in the borough. I want people to see how a Bronx Boy’s life is complicated, layered, and beautiful. 8) What was the biggest challenge in creating this project? I think the biggest challenge was myself. I’ve had this idea for awhile now, but I always came up with excuses to wait. Even when the process finally began, I would be scared to film and once I got the courage up to actually film, I wouldn’t want to even look at the footage. I had to convince myself that this project didn’t have to be perfect, it just had to exist. I just had to get it out there for everyone to see. Follow Adiana Rivera on her Instagram page., to stay up to date with the series. 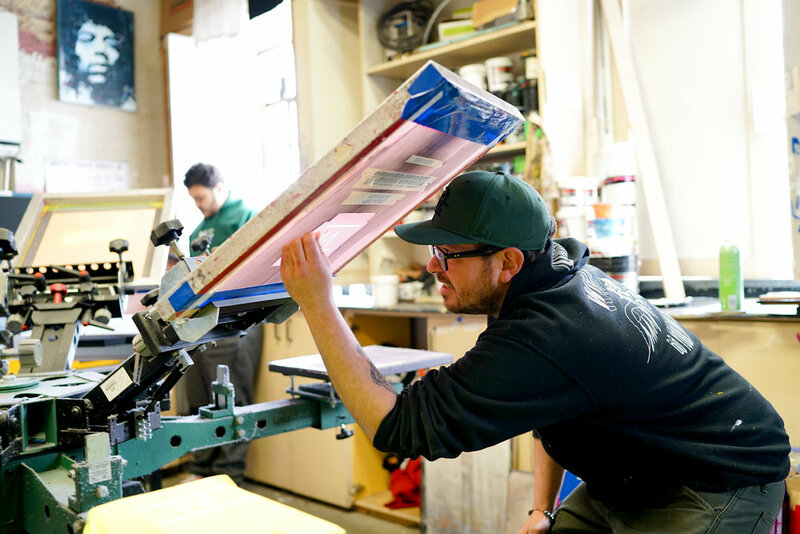 Hey I’m Eric, owner of Eric Michael Screen Printing, based out of the South Bronx in Port Morris. How long have you been here at the shop, and what made you decide upon opening in Port Morris? 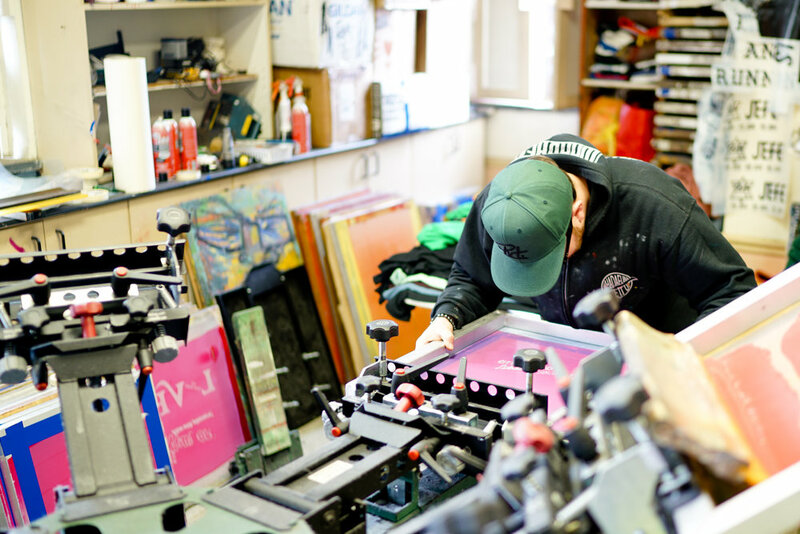 I have been in this shop a little over a year now - but I have been screen printing in the Bronx for 6 years. I got priced out of my neighborhood where I grew on the East side of Manhattan, which was also where my first studio was. This room [that we're in currently] was originally used for storage and my best friend suggested I move my operation here. I live about a mile away. I walk to work most of the time. What has kept you in the Bronx? I love the Bronx, I don’t plan on ever leaving the Bronx. I feel like it’s the last piece of real New York that’s left from when I was growing up. My neighborhood where I grew up is completely unrecognizable - the late 80s and and 90s were a completely different time. That is starting to happen over here a little bit. But there is still the essence and grit of New York that feels genuine. A certain amount of down to earth-ness. Now that you have lived here for so many years and have this space - and can see all of the changes that are going on and happening. How do feel about your business here seeing all that has been changing and happening - has there been growth? It’s been good being in this location. It’s brought new clientele and helped myself and my clients spark new interest in the arts that are happening in the Bronx. A lot of people have interest in keeping certain areas how they were -- authentic. Especially this area of the Bronx - it’s one of the last areas that hasn't been developed. For movie studios like Silvercup and HBO, it can be dressed up to look like any decade. I think that’s a big part of the reason why Silvercup just moved here. What inspired you to create the Loew’s Theater Shirt. You mentioned earlier, it sold out, and it feels like it belongs to a certain generation. What makes it so special? I really enjoy shirts that bring back nostalgic feelings. I did the Loew’s neon because it reminded me of Christmas time as a kid headed to Fordham Rd. My brand is my namesake and these designs are very personal to me. City Island also gives that warm feeling of family, celebration, summer time, because that particular neon is the first thing you see when you go over the bridge, so it brings up good feelings. I wanted to make that available to everyone. What are some of your favorite Bronx areas? I love the Northwest Bronx, where my first apartment was when i moved out my my families place. Of course, Mott Haven, where I currently live - I moved to the Clock Tower in 2012 and that is where many of my strongest bonds were formed. Some of my best friends and relationships are from that building. My girlfriend and I met there, my son was born the first year I moved to the building. The saying it takes a village to raise a child is so true, the building helped me raised my son. He was the first baby in the building, everyone knew him. How do you maintain a sense of community? At Bruckner Bar and Grill and Charlies, we all know each other. Everyone talks to one another, hanging out at the same places. Every Christmas at Charlie’s I have a holiday pop-up shop, which the whole neighborhood shows up for. Summer time has BBQ’s and garden maintenance days. That keeps everyone involved and engaged. There’s a real sense of community in our little corner of the BX. Who orders your shirts and who are your clients? Lots of local businesses. Lots of streetwear brands. People who are trying to get their names out there. I have built up a loyal following through word of mouth and it’s been effective. Most of my clients are artist, and so are their friends. They are rappers, musicians and in general a lot of people who are chasing their dreams. NY is the home of the hustle. That is why my business thrives. People in NY are always trying to make moves and t-shirts are a great way to do that. I have thought about moving the operation to LA, where it’s t-shirt season all year round, but the vibe is different. How has Graffiti inspired you? It all ties together - I would not be doing this if it wasn’t for graffiti. I needed a summer job when i was 18. At the time in 2001, trucker hats were all the rage. The foam domes, as we used to call them. My boys and I needed to work and we made those hats and used graffiti to make money. Then we expanded into sneakers which changed into airbrushing for tee shirts. After airbrushing it was a very natural crossover for me to then go on to screen printing. With the airbrushing I would spend an entire day on one shirt and I realized “hmm I should be thinking about mass production.” People were approaching me to do jobs - a job that would take me a week could then be done quicker with the screen printing. I happened to be dating someone who got me a great book on screen printing and I taught myself everything I know. Started in 2004 and haven’t stopped since. What are some of your goals for your business and yourself as an artist? I would like to be able to do my art full time, and be more selective about the printing jobs I take on. I’d like to do more mural work, as it helps the community, and brings people together. Each summer I try to paint a few pieces through the city. Made by Eric Michael is located at 789 E 139th St, Bronx NY. The definition of anarchism, according to the Stanford Encyclopedia of Philosophy, is “a political theory which is skeptical of the justification of authority and power.” The work of Gordon Matta-Clark which is currently on display at the Bronx Museum of Arts is intended to be the intersection of anarchy and architecture, an exhibition titled accordingly Anarchitect. When one thinks of architecture, one often thinks of physical structures. Especially as New Yorkers, we picture the structures that envelope our everyday life – skyscrapers, apartment buildings, subway stations. Gordon Matta-Clark, as an artist, looked at those same structures and created work that contemplated how structured political systems, such as a local and/or federal government, influence the structuring of everyday physical spaces. Walking into the Anarchitect exhibit at the Bronx Museum of Arts, the first thing that caught my attention was the paper cut outs of graffiti-covered subway carts wrapped around the exhibit rooms white walls. Below the wallpaper-like display were framed zoomed-in graffiti prints, leaving the location of the graffiti’s original placement ambiguous. I have always had a special interest in graffiti art; it’s relationship with systemic structures, and our relationship with graffiti as Bronx dwellers. We see graffiti everywhere, on everything and I can only speak for myself, but I don’t think much of it on an everyday basis. That being said, it was back in 2016, when I first read the words of Charles “Chaz” Bojórquez, in the March 2016 publication of Poetry that I began to think about the significance of graffiti in the lives of people who grew up and live in disenfranchised neighborhoods. That Bojórquez quote immediately came into mind when walking around the Matta-Clark’s exhibit, an exhibit where graffiti was displayed as art – graffiti displayed as work worth being framed. This quote is followed by the thought of my local subway station, the Kingsbridge station off of the D line, and the amount of times I’ve seen graffiti come and go through the years – painted over hastily and mostly carelessly with white paint. And in contrast, I consider the graffiti lined streets of gentrified Brooklyn that tourists and transplants take selfies in front of them for their Instagram pages. It is with these two images in mind, the Anarchitect exhibit I am left with questions about who has the authority to decide what graffiti is covered and which is displayed. What structures – what social, political and economic structures – have a role in deciding what gets to stay and what gets to go in our neighborhoods? That question is not limited to graffiti – but expands to our local shops, apartment buildings and schools. It is interesting to note that while Gordon Matta-Clark is on display in museums – the Anarchitect exhibit will be traveling to Paris, Estonia and Massachusetts after its stay at the Bronx Museum of Arts – the graffiti in the Bronx has continued to cover the structures of our borough. And faceless authorities continue to paint over what Bojórquez would call the bruises of our city. That being said, Gordon-Matta Clark’s work is a portfolio worth being displayed. His work is politically charged and potent with social significance – holding a specific weight by being displayed within the walls of the Bronx Museum of Art in the South Bronx. Gordon Matta-Clark’s work considered the relationship between what is constructed and what is destroyed. Besides graffiti, Matta-clark focused on the architecture that filled the South Bronx. As written as a precursor to the exhibit, speaking of Matta-Clark’s work with the demolished buildings of the Bronx, the exhibit wall reads “Like an urban archeologist he captured these remnants of by-gone habitation, peeling paint and residual wallpaper, evidence of the structure’s obsolesce as ‘home’.” It is through this description that we can begin to understand how physical structures such as an apartment building and abstract ideas such as the concept of home intersection, specifically for disenfranchised communities. Throughout his work and throughout the exhibit, the common thread is turning abstract ideas on their heads. By looking at how destruction and abandonment interact with physical structures, populations and systemic structures such as a local government that leaves behind a whole borough to fend for itself, Gordon Matta-Clark demands us to look closely at the spaces around us. In turn, he asks his audience to consider the ways physical structures speak to the abstract structure of our everyday lives. From subway stations, apartment buildings and the skyscrapers around us, from graffiti in the Bronx and graffiti in Brooklyn, these spaces speak volumes for how our social circumstances are constructed and deconstructed. If you’re interested in experiencing the Bronx in a new way, from the lens of an artist who brought attention to the aching bruises that filled and continue to fill the physical structures of our borough, I recommend visiting the Anarchitect exhibit, displaying at the Bronx Museum of Arts until April 8th, 2018. There, you can see for yourself, the intersection of anarchy and architecture from the eyes of Gordon Matta-Clark. Odane Whilby is a singer, songwriter, musician, with a soft spot for the Mott Haven area and a desire to support other artistic talents within the Bronx and beyond. 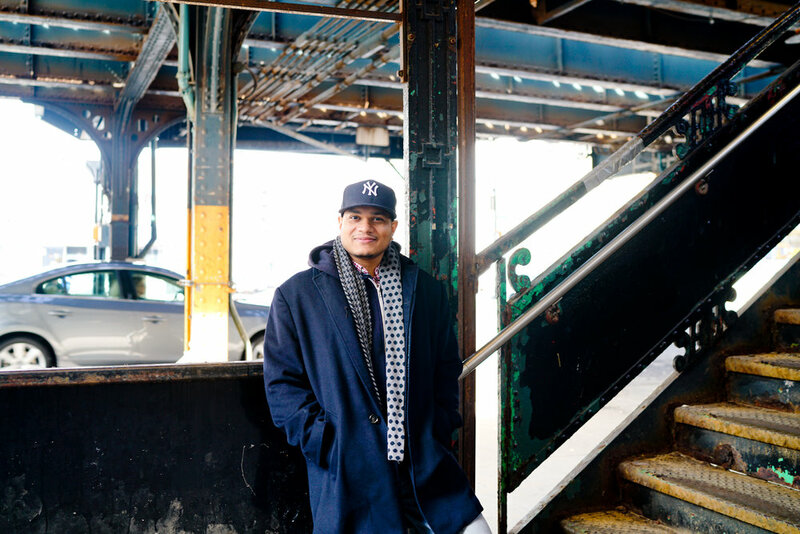 In his five years as a full-time musician, giving back to the arts community in the Bronx remains one of his priorities. 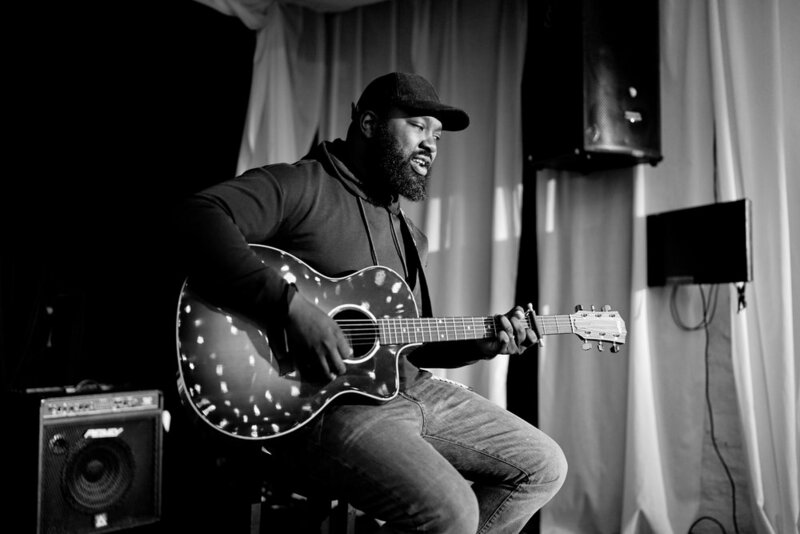 We met with Odane at Mott Haven Bar and Grill to discuss his journey as a budding musician, his feature on on Sofar NYC, and the current projects he’s spearheading. Whilby’s relationship with music began at an early age, “my mom said I used to dance to the windshield wiper as a kid. Music was everything... I don't know anything else,” said Odane, who has played bass since the age of 17. “I’ve been writing songs all my life but I never thought of it as something I could really do.” But he seriously started pursuing music as a career after he received an unexpected opportunity to perform his original music for the first time. “A friend of mine, Kelly Jones, she was very influential in me really try doing this as an artist. She gave me my first show. We were both supposed to do a part of the show but she had to cancel. I ended up doing the whole show. That was my intro into being an artist, that was my first hour set, my first time performing my own music and everything.” After that experience Odane went full force on the New York music scene, booking shows and learning the ropes. Unbeknownst to him, his experiences as a young artist would open the doors to his first art development project, the Bruckner Sessions. “It started at Lehman College. I met the director of Lehman Stages, Dante Albertie, through my [now] wife. At the time, I was starting out as an artist. I was hustling and bustling, and learning New York City as far as music artists are concerned. I was discussing with him the things I was learning, the things I wished that I could share with artists coming behind me so they wouldn’t have to go through some of the nonsense that I went through.” As a result, the Bruckner Sessions had been born. We all shared a laugh as he described the Bruckner Sessions as the hood version of American Idol this version offered no prizes for participation but focused on mentoring aspiring artists through music. Whilby used his knowledge as a musician, willingness to help upcoming artist, and connections made with professional musicians to offer mentorship and teach what he knew about music, songwriting and performance. 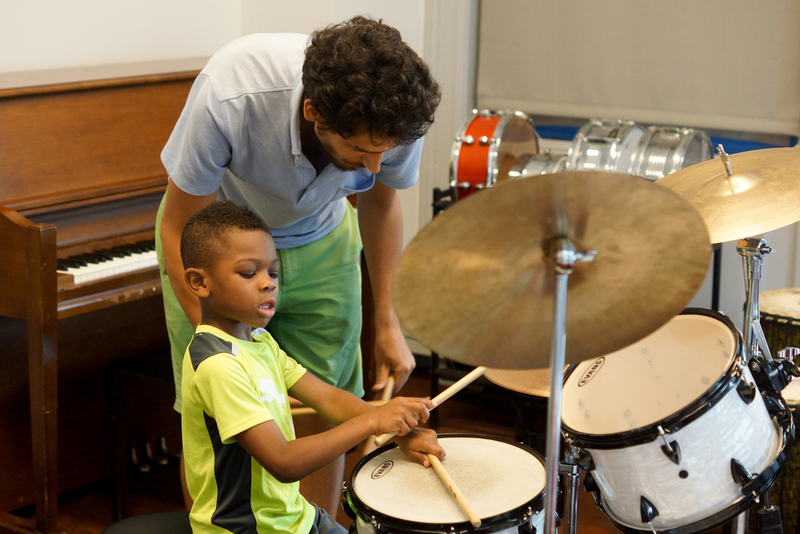 The change from the Bruckner Sessions to the Bronx Music Project was caused by the devastation of hurricane Sandy. “The whole area was under water,” Odane recalls. “It was very hard because that was my main source of income, it wasn’t a lot of money but it was important at that time. I was homeless. My family and I had lost our home, we were squatting and living in hotels. It was a very unbalanced time. The Bruckner Sessions before that was really thriving. We had to open the doors to accommodate the people. So [Sandy] was a big shock to the system. But everything is in God’s plan, God works things out. The year before things got back I got a call from Joseph (the current owner) they were looking for programming for a Saturday because they were starting back up. That whole year prior was like preparation. I had gone through some things. I met some people. I was really at my wits end. Somebody actually prophesied to me the month before I got the call, a guy by the name of Daryl Young. He told me three things, the first thing he said was really rough I didn't understand it at the time: he told me I would have to put the music down, my first kid was going to be a girl, and that people will call the ministry God has given me different. What [Daryl] said to me bothered me. At first I dismissed it…you can’t tell me that God’s telling me to put down music...I don't know anything else. The name ‘The Ology’ is a play on the word ‘theology’—the study of God and God’s relationship to the world. A name fitting for the event because Odane is catering to the niche of Christian artists. “I keep it specifically for believers because we’re working on what I believe is an issue, which is the lack of understanding of our creative power as a community of believers in this area. I feel like we don't understand who we are when you we work together. What I want is for The Ology to be a safe space for artists in the kingdom to come to be free as creatives. It’s about presenting people who are about quality and excellence it’s not really a development situation it’s more about presenting the quality we have as believers so that people can see that it's there. Some of the people who have passed through here can be on main stages they just haven't had the opportunity because the industry is limited to what the industry can do. Every ology is it’s own event, the people that come together make that night what it is. I think part of what people like about it is the organic feel. I stress the point that we have the power to keep that so that no one has to lock into what the mainstream is doing in order to survive. The people that attend can support all the artists that have come through The Ology so that they can have careers. Imagine if we were just committed to supporting artist because they are a part of this community.. Relationships are everything, the community is everything, us coming together is everything. That’s what’s important to me, building a platform where people have the opportunity to build relationships. Even collaborations, maybe another genre of music would come out of it, that would be crazy! It’s possible when you bring people together. This is the Bronx, the birthplace of hip hop...this could be the birthplace of something else. The Ology live show, which is held on the first Saturday of every month, currently features live music, spoken word and comedic segments by co host C. King. Whilby is also looking beyond music and brainstorming ways to showcase other art forms like photography, visual arts, and dance. Odane reminded me of the importance of perseverance. In the words of Walter Elliot, “Perseverance is not a long race; it is many short races one after the other.” During each short race there will be obstacles to get around, sometimes we will fail to beat those obstacles the way we believe we should but the key is to regroup, get back up and persevere. Odane persevered, through the many obstacles that came his way on his road to becoming a full-time musician and in turn, became someone who uses their talent and knowledge to give back to his community. Undoubtedly, a part of his process of getting back up included falling on his face in failure but also in prayer. His hard work continues to pay off as The Ology continues to thrive and he has been invited back to perform at Sofar Sounds this month. So what is it that you desire to do? In what ways do you hope to effect change in your community? There will no doubt be adversity on your way to success but always remember to get back up. To see what Odane Whiliby is up to next, follow him on Instagram. Or visit SoundCloud to listen to more of his music. 11 years ago Mainland Media LLC's co-founders, Anthony Ramirez II and John Martin, rented a helicopter to take aerial photos of the South Bronx. That was the precursor to FromtheBronx.com, the company’s online shop featuring Bronx-themed memorabilia and products. The helicopter tour reinforced what Ramirez and Martin believed about their borough: The Bronx was bigger than their immediate neighborhoods. And it was a source of pride and place of untapped potential – even if many residents and most outsiders didn’t share the sentiment. The company began putting down roots in 2006, just two years before the Recession of 2008. As banks tightened their loan policies, the years that followed proved to be a challenging time for many companies. A DePaul University study commissioned by the Small Business Administration found that within two years after the recession there was a $116 billion drop in lending to small businesses. At the start, the founders combined their own money to drive the business forward. Four years ago, a donation from an angel investor helped launch the Bronx Beer Hall. Now, the parent company of FromtheBronx.com and the Bronx Beer Hall is putting its Bronx expertise to work in the marketing and consulting area. The central pillar of Mainland Media’s business model is establishing partnerships and working with clients who are serious about the Bronx winning. 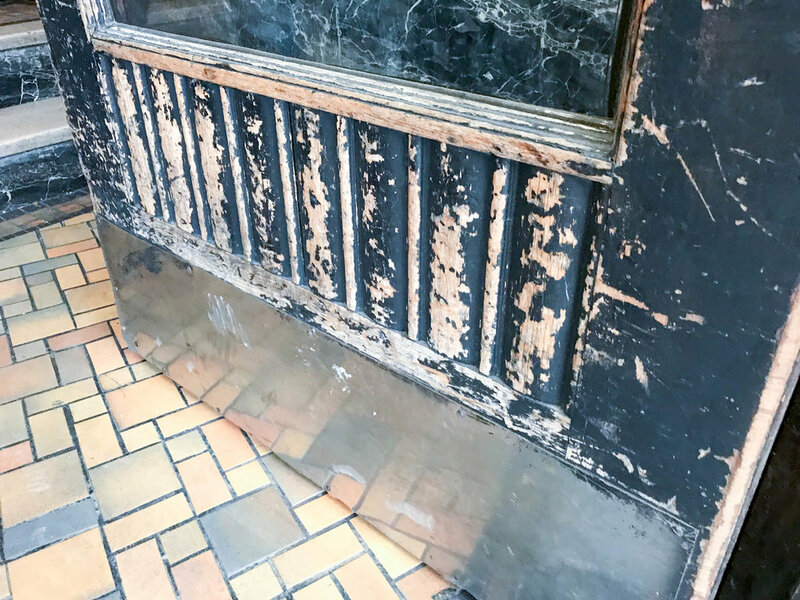 But the beer hall, the “new kid on the block” in the Arthur Avenue Retail Market, has been met with a mix of uneasiness and praise from long-standing merchants in the market, patrons and in the comment section of press coverage on the startup. Paul Ramirez, head of Mainland Media’s public relations, says it’s an inherently communal space and a prime venue to display the lesser-known side of the Bronx. “Our real goal is to further the image of the borough. Having these businesses gives us a platform to do that,” Ramirez said during our recent interview. Armed with a vision to showcase the best of the Bronx and overflowing rolodexes inherited from retired Bronx movers and shakers, Mainland Media is positioning to be a proponent of self-gentrification – making sustainable socio-economic improvements from within the borough. I spoke with Paul Ramirez about Mainland Media’s journey and business forecast. What was the idea behind taking aerial photos of the South Bronx? There were just no positive images of the Bronx. We’re talking about 11 years ago, [around] 2005, 2006. What are you going to find? You’re going to find Yankee Stadium, Rumble in the Bronx posters. You were finding Bronx Zoo stuff very easily. But nothing that was an accurate representation of the borough...The idea was [to capture] aerial images of landscapes. What does the Bronx mean to you? First you have to understand what the Bronx looks like. It turned into just instilling a sense of pride and confidence in people who weren’t proud of where they’re from. What motivates Mainland Media’s initiatives? The growth of the borough overall. We are fortunate enough to have people coming up who realize the value of staying within our borough and owning the identity of our borough. In the past four years we’ve seen such a growth in Bronx specific business. That’s our main motivation. We are actually influencing and hopefully setting a stage so that somebody can take the reins one day and just keep running with it. And there will be continuity as opposed to us dropping the ball and moving on to just focusing on beer. Why did Mainland Media go the LLC route? Everybody thought the best idea for this was to be a non-profit organization. And being a non-profit meant that we could do more community-based events and we could do a lot of things with money that we didn’t have to necessarily generate as much as we could bid for. We could put in a proposal, get a grant and then put our stuff to work. But we were working for non-profits at the time. We know how the money works. One of our [partners] was a grant writer for SoBro. My brother, [Anthony Ramirez II], was director of youth development at SoBro. I was the deputy director of Wildcat Service Corporation in Hunts Point. The non-profit game is a shady, sticky game. In what way is the non-profit industry shady? The models always have the best intentions written into their mission statements. But who’s running that? Is it a board of 12 gentlemen? Gentlemen. Definitely. No women on these boards. Are these 12 guys from the borough? Do they realize the needs within our community? Or do they realize what kinds of benefits and tax breaks they can get by creating a non-profit organization…in a space that [focuses on] at risk youth? As opposed to going the non-profit route, we realized that this was potentially a profitable business and we were inspired enough and we knew that we could get other businesses on board without writing proposals and fighting for grants. And it did work out that way for us. There are a lot of like-minded people, people who were born and raised here who realized how valuable what we were doing was and they were willing to help us out. What does it take to start an LLC? Everybody thinks it’s a hard thing. If you’re smart you own the website first and the website’s going to cost you 30 bucks, 40 bucks for the year. Obtain the URL; now nobody can take your business name. And you can start building content from there. And when you have enough money or you have an actual following and you see it’s going to be profitable turn it into an LLC. It’s an easy thing. It’s an online application. You pay via credit card. In a matter of days or weeks you have a business. On laying the groundwork before officially launching a business? I’d recommend entrepreneurs try to gauge who their audience is. It’s great to have an idea and to start a business, but if that business doesn’t have a core audience and you don’t know who your target is then what are you supposed to do? It’s trial by numbers and it’s not worth it. The foundation has to be there before you say ‘alright this is worth me investing, owning a website, creating content and servicing others.’ Think about how many people go into business with this great idea and they don’t make any money and they represent a brand that might resonate with people because they see it online. Unfortunately, people still think that “Likes” translate into dollars…You can like things all day. But it’s really about making sure you have an engaged audience. Interested in starting your own business? Check out this small business toolkit. Is it tough to convert online support into actual engagement? Initially it felt like it was. When we first started, Mainland Media didn’t resonate with anybody. Mainland resonates with people in Hawaii. It resonates with people in China, but for Mainland Media in New York City people didn’t acknowledge the fact that all the other boroughs are islands and the Bronx is the only one attached to the continental U.S. So while we thought this was smart and clever, it didn’t have an audience because the audience didn’t get what Mainland Media means. So we started FromtheBronx.com only because we felt the need –this was before Facebook – to have our own social media platform. And then Facebook took off. We realized that From the Bronx exists, but there’s a lot of backend stuff to do when hosting a social media site that we were going to be falling behind on or we were going to be competing with Facebook. Why compete with Facebook? We would be shooting ourselves in the foot. So we transitioned all the From the Bronx content to Facebook. [In the process] we realized that From the Bronx is so much easier for people to click with. Are you working with Bronx Artists to produce merchandise for the online store? Right now we’re working on a collaboration with Bronx Native. [If] anybody wants to sell something via our website, approach us. It’s only going to make sure more people see your stuff. We worked with Project Bronx last year. And their t-shirts sold out. We’re more than open to work with anybody who has a positive outlook on the borough. How important is it to have a physical space like the Bronx Beer Hall? Press for the beer hall is leaps and bounds beyond what we expected; it’s really what’s helped us garner more clients for Mainland Media. We always said we wanted it, and the fact that it happened so organically was like ‘this was meant to be.’ We were meant to have this platform. While we’ve obviously had obstacles being in a neighborhood that we’re not from, our mission does resonate well enough that our neighbors see the power of a younger mindset, a stricter concept and the ability to pull people in. Do you know how many friends I’ve made here just off the strength of having this public space? Arthur Avenue is the number two tourist destination in the borough. The venue lends a lot to improving the overall image [of the Bronx]. If we’re packed you better know that you’re going to end up engaging people you wouldn’t otherwise sit with. It [starts] a whole conversation about the negative perceptions…and now their point of view has been changed, and not by me. [But] by somebody who’s in my space because my space exists. We’ve put our clients in interesting situations sometimes. There are nonprofits that are kind of getting funding from wherever they can. But when we explain to them why they shouldn’t be accepting this sort of funding because they’re on the same wavelength they’re willing to go against it. As a consultant I can tell you anything. You don’t have to do it. You’re paying me for my advice. But if you accept a $10,000 grant from [someone] you’ve just legitimized [them]. We try not to put our stamp on [something] if we don’t believe in it. We do so many events. I sit on the junior board for WHEDco. We do large events for them. We do large events for the Parks Department. All the things that we personally think the borough needs to have more of a push behind we get behind. We did the launch for Bronx Exchange, which is essentially an online white pages. So something like that it’s serving the benefit of the community at large. Why wouldn’t we host them? Why would I charge you for using my space? Come in. We’ll figure out everything else after that. That’s the way I work and it surprises a lot of people. We’re not only thinking about the money. We’re thinking about the growth overall, but the growth overall is going to lead to economic growth for everybody involved. That’s how we see it. And that’s why we don’t make our own food [at the beer hall]. What would I look like walking in here trying to make a meatball? Why wouldn’t I want to showcase everything that the neighborhood has to offer? How do you balance maintaining business relationships and making a profit? Sometimes you have to sacrifice the profit for the relationship. Sometimes you have to sacrifice the relationship for the profit. If you understand that there are relationships that are one-sided and completely self-serving for another party…and if they’re not benefiting me in any way that’s when the sacrifice comes in. We’ve worked with plenty of Bronx businesses that still owe us. And it’s better to walk away than for me to sit and harp about “what I did for you.” Meanwhile, they still come to the Bronx Beer Hall. They’re still trying to engage with people we engage with. But we’re still here. I’m doing this because I love doing this. People have to understand that we’re approachable. We’re not making boatloads of money. We’re doing good work for the community. In doing those things it becomes that there’s a certain air about [us], but we’re still just two brothers born and raised in the Bronx. All of our business partners were born and raised in the Bronx. Guys with full scholarships to Horace Mann [School]. One’s from Woodlawn. One’s from Bainbridge. [My brother and I] are from West Farms/Parkchester. It’s about the borough…We’re still here to make sure that we’re entrenched in everything that goes on in the borough. What are your thoughts on fundraising? I think it’s really about finding your industry and identifying within your industry how most people go about it. Everything for Mainland Media was funded ground up out of our own pockets. Whatever little money we had got pooled together and then everybody got their money back, nothing extra on top and now the business runs. Obtaining funding is very industry specific. Crowdsourcing is amazing, but you have to make sure you have the audience before you can go out there. It’s about marketing yourself. And the advent of Facebook and other social media sites have really allowed people to see the power within themselves; they don’t have to be backed by a brand. But it’s about building that network. There are a lot of older Bronxites when we started 11 years ago who are now retired and they are no longer in the position they once held, but since they realized the work that we were doing they’ve made sure to connect us with people. Staying awake. I sleep about three hours a day. We’re spread thin, but we do good work. The work that we do is beyond us. It’s not just about us. That’s what drives me. But time is the hardest part. What’s the vision for long term expansion? We just really want to see the face of the business change in the borough. I want to see the quality of the politicians change in the borough. There are a lot of things that has to come from within and we only set the stage for those coming behind us. If I can inspire some [young Bronxite] to say ‘I want to do better for my community,’ If I can do that it doesn’t matter where my business goes. We know we’re going to flourish. We know we’re going to do better. We know there’s always going to be an interest in the borough going forward. We just have to be selective. And the work that we do speaks for itself. What advice would you give to up and coming entrepreneurs? Do your best. Don’t second guess yourself. Know your own limits. Understand when you don’t know something be outright and say that because you can land yourself in a serious hole if you pretend to be bigger than what you are. [Go to] networking events. You can’t be scared to approach somebody. Treat everybody exactly the same. I don’t care how much money you have in your bank account. I don’t care if that’s a black card on my bar. It doesn’t matter. It’s about your integrity. Be fair and be willing to talk anybody. We’re in a day and age where everybody’s accessible: via a tweet, a DM, via an email, via a mention. The possibilities are endless. Don’t be scared. Everybody got their start somewhere. Stay on top of what Mainland Media is doing on Facebook and Twitter. 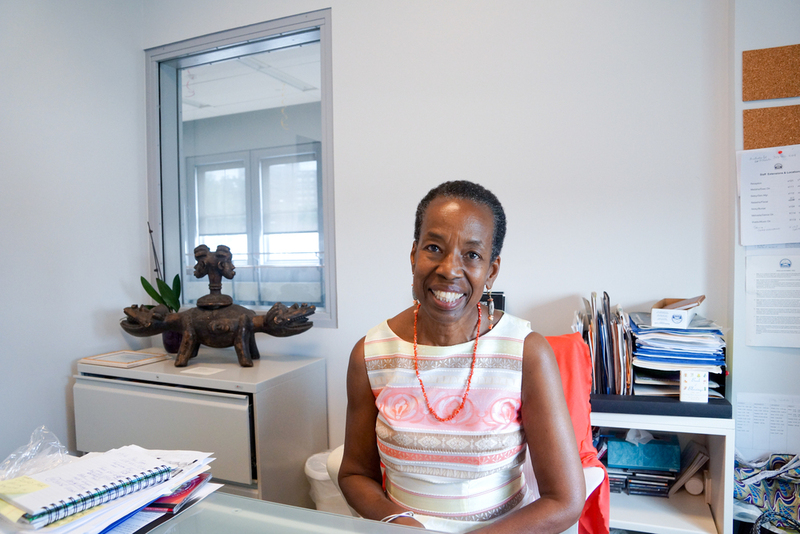 Tessa Smith is an Antiguan-born, NYC-based writer and supporter of the Arts. For more of her work follow her on Instagram @thefringes. Have you seen Get Out? For a week, I avoided reviews, articles and social media posts about how “deep” and “good” the movie was. Why? Because of spoilers! But attempting to dodge social media posts and comments on my timeline was enough motivation to purchase tickets for an 8:15 PM showing on a Saturday night. I believe Get Out lived up to the hype surrounding it. It was layered and nuanced in its dealing with the current climate of race relations in America. It is the type of movie you must really pay attention to in order to connect all of the dots. On the ride home my sister and I discussed the film and read those articles I initially avoided. The comment sections were filled with strangers who gathered to dissect, share theories, and seek clarity on the film’s theme. I love films that make you think and then think some more; films that challenge you to engage them long after the credits have rolled–like psychological thrillers for instance. That’s what makes a good film. What makes a film good for you? What makes a film good in general? 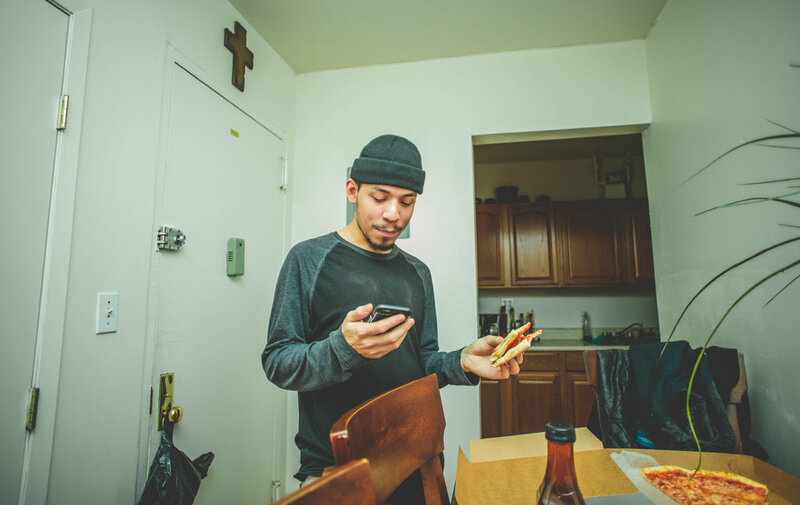 Bronx native Harri “Indio” Ramkishun says, “it’s about communication. As long as you are able to communicate in a clear way, the message gets across. Obviously some people might not like the message but if you're true in your commitment to communicate a story and you did your best trying to convey it, you’ve done your job and hopefully people understand it.” As a filmmaker, director, editor, producer, teacher of film production at BronxNet, founding member of The Bronx Filmmakers Collective, and owner and operator of GuyaRican Productions, Indio, has plenty of insight on filmmaking and the importance of honestly and effectively communicating a story. For the GuyaRican–a moniker created by combining Guyanese and Puerto Rican, his cultural backgrounds–the road to becoming a filmmaker was unconventional. He transitioned from the music industry to TV film a little over ten years ago when he was a contestant on a reality show on the YES Network. I was in the music industry. When things weren’t going well with the transition of mechanical (physical products such as CDs, records, etc) to digital, I took an opportunity to be on a sports reality show about die hard Yankee fans competing in challenges to win tickets to Yankee games. [I was] born and raised in The Bronx, and played across the street from Yankee stadium, so why not? I knew that was going to be my transition into TV film. I auditioned and after about a 20 minute talk with producers they said they wanted me. I think there are at least two different routes to get to the same destination. While mine may have been unconventional, the common denominator is networking. Oftentimes you’ll see people who went to NYU, for example, their team is basically built from classmates they were working with. It’s the same thing for me and trying to build a community of filmmakers. The resources may not be there but as with anything if you’re really passionate about what you do you’ll find ways to make it happen. I wrote, produced and directed my first short film. Rather than have the opportunity to go to film school I created a film to learn. That was my learning curve. A lot of my colleagues helped with the project, they bought in the cameras and the lights and we shot it in my apartment in Riverdale. The results weren’t the best but it was an experience. From then I continued to learn about operating the cameras and would soon become the Director of Photography on various short films. Do you think that is why a lot of people in the Bronx don’t pursue film? Filmmaking is a long journey some people may see it as attainable but it takes too long. There have been great filmmakers that have come out of The Bronx but you have a generation gap from Penny and Garry Marshall (1960s) who grew up on East Tremont to Rashaad Ernesto Green who directed the film Gun Hill Road (2011). He was able to cross over to hollywood and direct shows. But we are a community of 1.4 million people [as of 2013] and growing so I think the numbers will only go up from there. Being a part of The Bronx Filmmakers Collective (TBxC) I get to know the other filmmakers of the bronx and we help each other out. Bronx filmmakers are out there, we’re just a little scattered. How did The Bronx Filmmakers Collective start? In September 2012 I heard about a meeting reaching out to Bronx Filmmakers at the Bronx Documentary Center. Hannah Leshaw, (co-founder of The Bronx Filmmakers) asked Michael Kamber, (the co-founder of Bronx Documentary Center), to meet there. I went and said [to Leshaw], “this is what I’ve been looking for, I want to help you make this happen.” We banded together. We’re in our 5th year now. We recently filed the paperwork to become a non profit. Soon we’ll be able to seek grants to potentially offer scholarships to members so they can create their own projects. What types of themes does TBxC write about? We tend to avoid the themes that people most often connect to The Bronx: gang violence, ghetto, gritty, The Bronx is burning, abandoned buildings scenarios. We capture real stories. We hear and see stories of perseverance and trying to make it. Many people can relate to that, not just Bronxites, those type of stories are the ones members gravitate to. The process of joining TBFC? There is an application process and we require that you have a film, whether you submitted it to a festival or created it on your own. Any films that have really inspired you? I love all kinds of stories but I've always been compelled to look at Ang Lee movies both cinematically and storytelling wise. He has such a way with directing these stories from Crouching Tiger to Life of Pie. On the flip side I love movies like The Best Man, Brown Sugar, and Love and Basketball by Gina Bythewood; her husband Reggie Rock is a Bronxite. I got a chance to talk to him, I told him when he comes back to the Bronx look [The Bronx Film Collective] up and talk to us. We can record films on iPhones now, do you feel that filmmaking is still valued? At the end of the day, whether it’s an Arri Alexa or an iPhone if you're not telling a story cohesively, it’s just images and audio scrambled together. So while there has been an influx of “filmmakers” it still takes a level of passion, training and practicing on your own. I think the doors are open to many people especially in communities where you don't have as much money to go to film school, the NYUs and the USCs, so you can just learn by doing and practice. The best examples are those that are already out, find your favorite movies and watch them. Have a sketch pad and write down what you liked best about the movie–try to replicate that on your own and put your spin to it. I have a Moleskine book where I do that and refer back to it. How do you view streaming platforms like Netflix, Hulu, and Youtube as a filmmaker? I think it can be a double-edged sword, because of the amount of content that is being produced it does make it hard to stand out. [And] I know many of those outlets will take products that aren’t refined but completed. In an era of “alternative facts” and “fake news” jargon, how important is it to control our narratives especially as one pursuing film? The truth is being bent in certain ways but honestly speaking… this is no different from how it was 30 to 40 years ago. Filmmaking is the same, the technology has changed but the main thing hasn’t changed and it’s that you have to tell a story that is compelling and true at least in that world. It’s about communication as long as you are able to communicate in a clear way, the message gets across, obviously some people might not like the message but if you're true in your commitment to communicate a story and you did your best trying to convey it, you’ve done your job and hopefully people understand it. I’m writing a feature film–it’s been a slow process. Hopefully when it’s done people will see the story, get it and be moved by it. It’s a coming of age story about a 17 year old kid who just graduated high school and all the circumstances that happen that may cause him not to go to college. You can be on the right path and a brick wall goes up in your face in no time. It’s something that I’ve seen in my own life and with my friends and family. I wanted to put that in a narrative. The responsibility of a filmmaker is to be able to convey a story in a clear and concise manner so that your audience will get what you’re trying to say. While talking to Indio I was reminded that as we move through this world, we enjoy things most when we are able to connect, understand, and see ourselves in them, especially films. With technological advancement and the newer, more accessible means for us to pursue our passions, I’m looking forward to watching more films written and directed by Bronxites passionate about perfecting their skills and telling honest stories. I’m waiting for more films that will help us to grapple with the issues of our communities and our time and will incite us to action. Films that make us laugh, cry, but most importantly think and then think some more. May I suggest psychological thriller? The Bronx Entrepreneurs Series: Perspectives on Creative Industry. The blogosphere is bursting at the seams. At the rate that blogs are started and abandoned, it’s hard to pin down the number; but some sources say hundreds of millions of blogs exist. That’s a massive jump from the eight million Technorati reported in 2010. The blog index turned advertising tech company said that seven years ago bloggers were writing roughly 12,000 blog posts daily. In 2017, bloggers around the world are writing millions of posts every day. Worldometer’s daily counter uses Technorati’s formula to calculate the number of blog posts produced worldwide. Today’s blog buffet features everything from food to parenting tips to LEGO Bricks. It’s no surprise that successful bloggers have an angle and a marketing strategy. Business savvy bloggers pursuing an ever-increasing reach are implementing campaigns that crisscross their social media platforms and collaborating with other influencers is no longer an afterthought. According to Hubspot, a top social media marketing analytics firm, blog content creation was the number two priority for businesses in 2016; followed by their goals of expanding their search engine optimization (SEO) and building an organic presence to engage consumers. In 2015, Hubspot reported that blogs had been rated the 5th most trusted source for accurate online information. Today, companies and individual bloggers alike are aiming to drive sales by creating relevant content that connects with readers on issues and products they care about. Like Christina Akomea, a style enthusiast who’s building a following through a shared passion for affordable fashion. Corporate professional and fashion blogger Christina Akomea of Just Missed the Runway (JMTR) is forging her path in the industry. But she isn’t a newcomer to entrepreneurial endeavors. She went from selling fruit snacks during Cardinal Spellman high school track meets to partnering with companies like Chinese-based clothing retailer, Romwe, and “afri-glam” brand Fingercomber. Drawing inspiration for her signature tailored silhouettes from NYC architecture, the Northeast Bronx native is cultivating a resource for women who seek classy corporate looks. This month marks the three-year anniversary of JMTR’s launch. With more than 8k social media followers and 2k unique visitors each month, the lifestyle brand is tapping into a unique space by blending fashion and modesty. On JMTR “more is more.” But more is not boring. JMTR has been featured on popular fashion sites like Fashion Bomb Daily and Style Blazer. In 2017 the blog will also feature health and fitness content. What’s the idea behind your blog name? I have to give credit to my friend Janelle…I was trying to figure out who I was and the audience I was trying to reach… I’m like alright, I’m this 5’3 girl, I’m not big but according to society’s standards I’m not really a model. But I can dress like a model on the runway. But I really can’t make it on the runway. So I was like I just missed the runway I guess. [Janelle] said that’s it: Just Missed the Runway! How did you learn about getting into fashion blogging? For the first two years I really just enjoyed shooting and posting pictures…. It may be vain, but I really just enjoyed doing it. I had a career, but that’s what I looked forward to doing on the weekend…Maybe I came across a website or an article talking about how to monetize your blog …There’s a plethora of research on how to monetize your blog. I was at conference and I saw a girl with natural hair… I complimented her and she’s like “Oh, it’s a wig.” And she gave me the website. I bought the wig and I bought it for my mother. I was wearing it all the time… The amount of times people stopped me and asked about [the wig] and I gave them the website, I thought I’m making [the company] a lot of money… I sent them an email and I asked if there were any opportunities for us to collaborate. I think at the time I was just looking for free wigs…They sent me an [affiliate] agreement. It had the numbers on there. Because I’m a business person ... I negotiated for more and they gave it to me. And the good thing about that is I’m not just selling something. I actually believe in the company and I wear the [wig] all the time…People know that even before I had the agreement…I purchased the wig with my own money. How has your educational background shaped your vision as business woman? In undergrad I studied risk management and insurance…I felt I had a really narrow background because my education is so focused on this career path and every job I worked after graduation was in the insurance industry…I always knew I wanted other opportunities…I thought it was a great idea to get an MBA.…My MBA is what allowed me to really broaden my opportunities with blogging…I had to do a bunch of consulting work and a whole bunch of cool projects. How do you balance a 9-5 and blogging? I think passion helps because if you’re not passionate about it it will be difficult. Not only do I have a 9-5, I also work at Banana Republic part-time. I really work 70 hours a week…I work part-time at Banana Republic only because I need the fashion experience. I’ve never worked in retail. And I have aspirations to start my own clothing line…I’m learning so much about clothes that I’ve never known. But juggling is really hard. If you look at my car I have 8 billion things in the back because after this I have to shoot. I don’t shoot everyday like most bloggers… Sometimes I’ll do six to eight looks within two hours. In the winter time it’s freezing outside! It’s really a serious commitment, but because I’m passionate about it I can overlook weather and time. Are you a risk taker in business? I’m in the middle between being risk averse and being a risk taker. I’m trying to become a risk taker but it’s kind of hard. I think that my [corporate] career has made me very comfortable. I feel like if I was a risk taker I would get to where I want to be so much faster. I’d be pressured to figure it out and work harder. To send more emails trying to get more collaborations…I’m trying to get there bit by bit. But it’s really hard. How did you get into the “modest fashion” niche? I think with growth it happened. When I first started I wanted to do any and everything… Every time I tried to do something that contradicted my identity it just wasn’t successful. If I tried to wear a Bodycon – not knocking Bodycon – either the pictures would come out wrong or people didn’t receive it the way I thought they would. Growing spiritually has helped me kind of figure out what I want to do and how I want to present myself. I’ve learned that I wanted to be more modest… I think that you should never feel bad about not attracting everyone. Part of the reason people are successful is because they realize what their niche is and they know how to connect. I get more feedback now that I focus on modesty. What’s your view on shooting in the Bronx? Just for the aesthetic of blogging… from what I’ve seen Manhattan appears to have cleaner places, cleaner structures, better buildings than the Bronx… A lot of the NYC fashion bloggers who have 800k followers and who have made this a business…They always shoot in certain areas. Most times it’s in Brooklyn and Manhattan. My struggle is partly because I don’t know a lot of places in the Bronx… But the building structures are not conducive to the aesthetic I’m going for. I have to think deeper than just my blog pictures. A lot of people don’t realize that Instagram and the layout of your Instagram are so important. I just can’t post any picture. It’s just going to throw off my whole aesthetic. I’ll say that because I haven’t done that much research looking for places in the Bronx, I kind of just go with places I know, which is the city. People in Manhattan are more receptive to creative people. Shooting summer looks in the winter is acceptable when you’re in Manhattan. Shooting that in the Bronx…people take out their phones or they just start watching, men do inappropriate things. It’s just really uncomfortable. You have to be around places where they allow you to be creative and just do what you do. How would you advise new bloggers who want to collaborate with companies? The simplest advice I can give is get your followers up. Nobody cares about who you are unless you have followers…If you don’t have followers nobody’s going to want to collaborate with you. Nobody feels the need to…partner with you if they feel you don’t have a reach. The wig company was great, but before that I got 8000 “Noes.” I’ve been denied so many times. Also, in 2017, if you want to be a blogger, first you have to step your blog or your website pictures up. The market is too saturated. There are too many talented people…too many great pictures out there for somebody to focus on your blurry pictures. What about people who feel the need to buy followers? That’s the bad part about trying to get followers. Are you even sincere? Are you passionate about it?...If you’re trying to go into it because you realize there is money to be made you’re going to burn out. You may make it there. But you’re going to burn out. Most of the people in the vlogging/blogging industry have started not trying to make money. They were passionate about it and the passion showed. And they’ve gotten opportunities from it. …I’m not interested in Fashion Week. I’m not interested in runway shows. I have received so many invitations and I always deny all of them. I don’t really pull inspiration from runway fashion. Strangely enough, my name is Just Missed the Runway. I don’t care what [high end designers] think the new trends are. Of course I’m influenced in some way. Even if I don’t go on Tommy Hilfiger or Prada’s new collection I’m looking at a blogger who may have been inspired by Prada, but I just never really cared to even sit in the back at a fashion show…But I realize that I have to kind of foster those relationships because the people that foster those relationships get better opportunities…I also haven’t even decided that I want to really make my footprint in the mainstream commercial fashion industry…I feel like I kind of want to start my own thing. Now they are. My parents are African. They are really traditional. Now that they see the packages coming. All the free clothes. When they see the checks coming in the mail. They’re like “You can actually do something with this.” Now they’re cheering me on. Now my dad is like “ok I’m going to iron your clothes for you. I’ll help you pack your car.”… It was a different narrative before. Before it was “You need to focus on work. You need to focus on school.”… Now they’re excited. Do you have any words for aspiring fashion Bronx Bloggers? You just have to research. Invest in a good camera. Have a very clean website. Be very consistent with posting. Some people are going to say that you’re annoying. But annoying people get more partnerships and collaborations. You have to be on a schedule. Your readers should expect to see something from you. Specifically for Bronx bloggers there is a need for someone who’s going to highlight the Bronx well. We have 8 million Manhattan bloggers. When you say NYC fashion blogger if you click on the hashtag [on Instagram], it’s referring to Manhattan bloggers…We don’t have anyone that’s really focusing on only shooting in the Bronx. It’s probably a market that you can tap into. You have to find a way to be very creative and stand out…I may even take that advice myself. Look out for Christina’s latest posts on Instagram @justmissedtherunway.